The first footage from the Guillermo del Toro-produced Scary Stories to Tell in the Dark has finally been revealed. Norwegian filmmaker Andre Ovredal is taking on the directorial duties, which started filming in August 2018 and wrapped in late October. Before this week, we had only seen one official behind-the-scenes image along with a picture of a gloomy-looking house all lit up to look frightening. However, an official poster of Harold the Scarecrow made its way online along with the official launch the movie's website earlier this week. Once the official Scary Stories to tell in the Dark website launched and the first Scary Stories poster debuted, it was only a matter of time before the trailer dropped. Fans of Alvin Schwartz's children's book series have been waiting a long time for a big screen adaptation and the time is almost here. The movie hits theaters in August, and from the looks of the first trailer, it looks like it's staying true to Stephen Gammell's iconic artwork from the book series, just like what was promised. The Scary Stories to Tell in the Dark movie centers on a group of teens who are forced to solve the mystery of some recent brutal murders in their town. It has also been rumored that the human scarecrow from the Harold story and the girl who has spiders crawl out of her face in The Red Spot story will be involved in the movie, but only Harold seems to be confirmed at this time through the release of the first poster. Both of the aforementioned characters appeared in 1991's Scary Stories 3: More Tales to Chill Your Bones. Guillermo del Toro has wanted to make the Scary Stories to Tell in the Dark movie for years and his dream is finally coming true. In 2013, CBS Films acquired the rights to the Alvin Schwartz's children's horror book series with the intention of making a big screen adaptation at that time. For unknown reasons, it wasn't until 2016 that del Toro was attached to direct and then later he stepped down from helming the project and Andre Ovredal stepped up to direct the horror project. Del Toro remains on board as producer and co-writer. 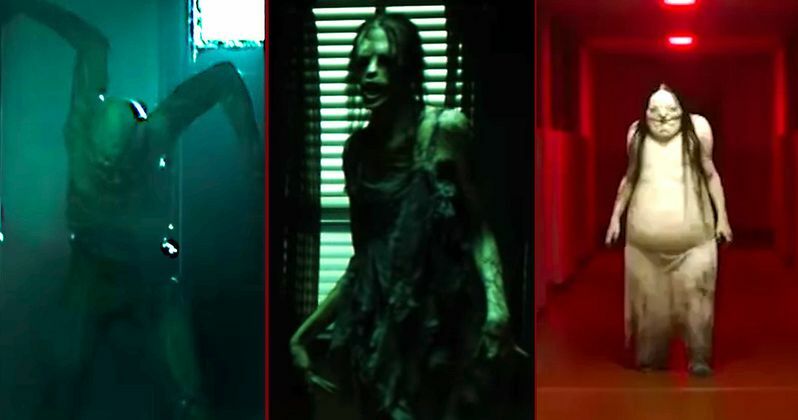 Now that we've seen the first footage at the Super Bowl, Scary Stories to Tell in the Dark hits theaters on August 9th and Zoe Colletti, Michael Garza, Gabriel Rush, Austin Abrams, Dean Norris, Kathleen Pollard, Gil Bellows, Lorraine Toussaint, Austin Zajur, and Natalie Ganzhorn star in the movie. There will be some competition at the box office at this time with the Fast and Furious spin-off Hobbs & Shaw debuting the week before. However, there will more than likely be a pretty different crowd in line to see Scary Stories to Tell in the Dark. While the wait has been long, we finally have our first look at the horror movie. You can watch the first Scary Stories to Tell in the Dark footage below, provided by Entertainment One.